Crock Pot Sausage Black Beans and Rice is a hearty, easy to make and inexpensive dinner. Crock Pot Sausage Black Beans and Rice is one of those dishes that is so easy to make and so good. I never use to love my crock pot but over the years it's grown on me. I love being able to start dinner in the morning and know it will be done on time with very little fuss. Sausage black beans and rice could be served as a side but we love it as our main dish with a big slice of cornbread slathered in butter and drizzled with honey. I used brown rice in the recipe because it maintains it's texture better then white rice which is important with the long cooking time. I strongly suggest serving the Sausage Black Beans and Rice with a selection of toppings like sour cream or greek yogurt, green onions, lime slices, fresh cilantro and cheese. The extra options seems to appease even the pickiest eater. 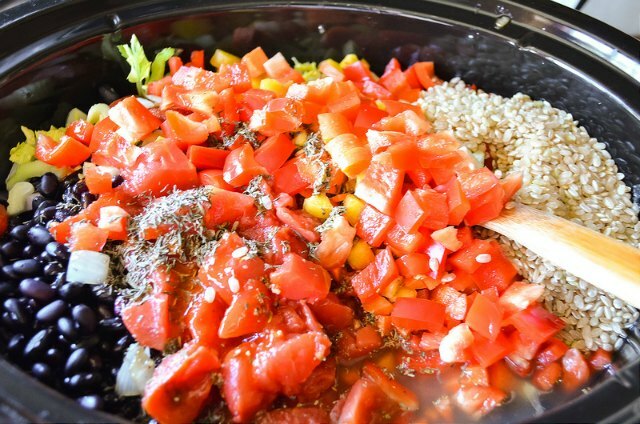 For more Crock Pot ideas check these recipes out. 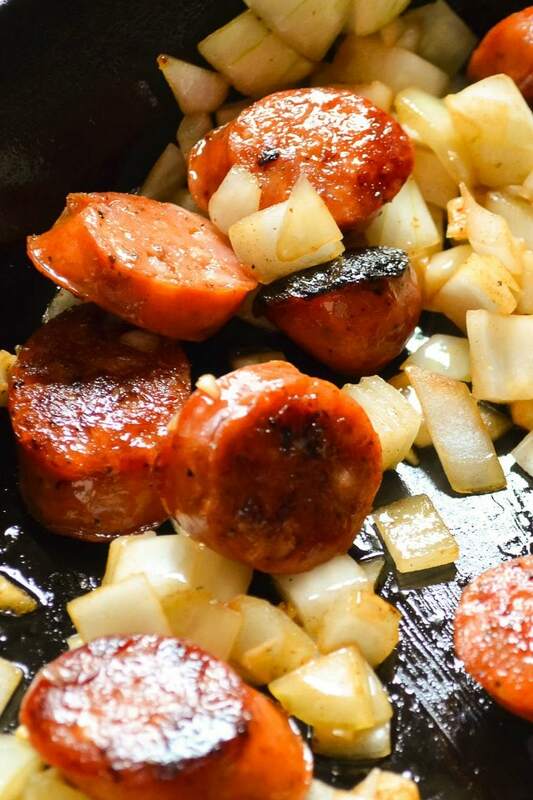 In a large sauce pan heat 1 tablespoon olive oil and brown the sliced smoked sausage on both sides. Add a chopped onion and cook until the onion starts to caramelize to build another layer of flavor to the beans. Add the sausage and onion mixture to the crock pot along with 1 pound black beans soaked overnight, 4 cloves of minced garlic, 14.5 ounces diced tomatoes with juice, 6 cups chicken broth, 2 cups Water, 4 diced carrots, 4 stalks celery diced, 1 chopped red bell pepper, 1 teaspoon thyme, 1 teaspoon italian seasoning, 2 tablespoon chili powder, 1 teaspoon garlic powder, 1 teaspoon Cumin, 1 teaspoon hot sauce or to taste and 1 cup brown rice. Mix ingredients well and cover crock pot. Cook for 6 hours on hi or 8-10 hours on low. Stir in 4 tablespoons tomato paste 30 minutes - 1 hour before serving. Once beans are tender season with salt to taste. I used 1 teaspoon of sea salt. Serve with corn bread, sour cream or greek yogurt, fresh lime, green onions, fresh cilantro and cheese. 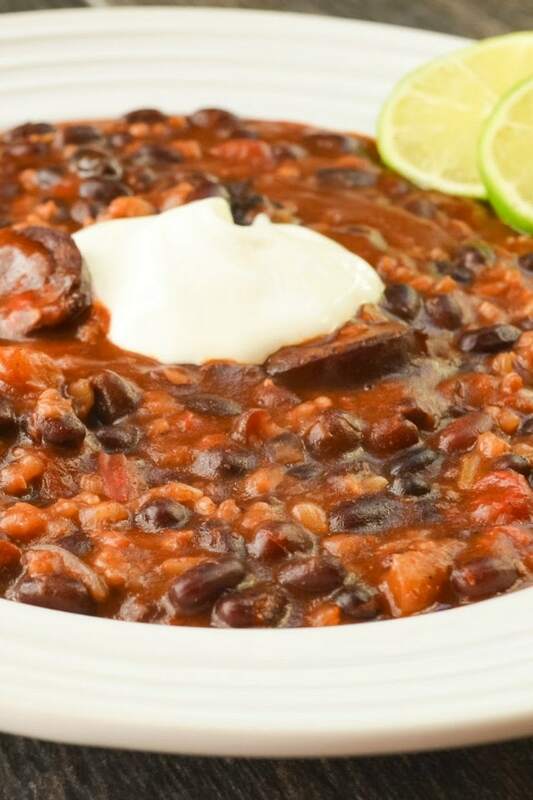 Crock Pot Sausage Black Beans and Rice is a healthy and easy dinner from Serena Bakes Simply From Scratch. In a large pan heat 1 tablespoon olive oil over medium heat. Add sausage and brown on both sides. Add diced onion and cook until onion starts to caramelize. 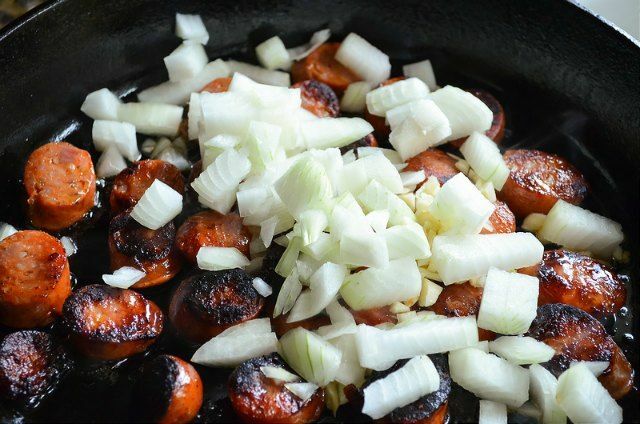 Put sausage, onions, and black beans in the crock pot. 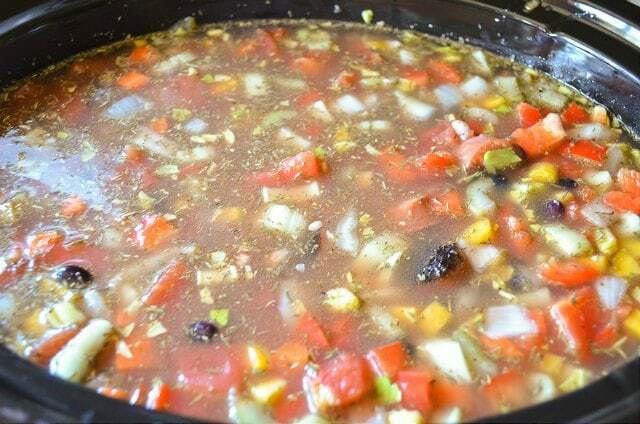 Add garlic, diced tomatoes, chicken broth, water, carrots, celery, bell pepper, thyme, italian seasoning, chili powder, garlic powder, cumin, hot sauce and rice. Stir mixture well and cook on high 6 hours or low 8-10 hours. 30 minutes- 1 hour before serving stir in tomato paste, salt and pepper. I am excited to try this to warm up these winter days! I would like to replace the sausage with chicken. Any suggestions for preparation of the chicken before putting in the crock pot? Also, does the use of the tomato paste and tomatoes in juice take away from the dish being "from scratch"? Thanks!! Hi Lucy, I would cook the chicken cut up just like the sausage and lightly brown it on the outside. As for the tomato paste and tomatoes it just really depends on your opinion, some people can all their own canned tomatoes and make paste. Fresh tomatoes aren't always as flavorful dependent on the time of year; canned tomatoes are pretty dependable for good flavor and most the time don't have much added to them. Thanks for stopping by! Ok great! My apologies for the multiple comments yesterday, I have never commented on a blog before and wasn't sure what I was doing! I am very new at this cooking thing :) So just to make sure: cut up the chicken and just brown the outsides but keep it pretty much raw before putting in the crock pot? Thanks! I'll definitely be trying out more of your recipes. Hi Lucy, No problems about the comments, I figured you weren't sure if it had saved it. Yes the chicken doesn't need to be cooked all the way since it will be in the crock pot but searing the outside will help keep it moist. I'm glad you found my blog. One of my goals is to take the fear out of cooking and that is why I decided to add the step by step photos. Hi Sam, Sorry it's sometimes delayed for comments. Did you wait to add the salt until the end? Sometimes salt can make the beans stay firm so I always add it after they've been cooked but I've never run into chicken broth effecting it. The other option would be to quick soak the beans on the stove by bringing the beans to a boil covering, removing from heat and letting sit for 2 hours before draining. Quick soaking par cooks the beans a little so they will start off more tender. They really should have been super tender after so much time soaking and cooking the only other thing I can think of is could the beans possibly have been older? I know I had some sitting in the cupboard for sometime to make chili and when I finally went to make it the beans just wouldn't soften. The other option would be to use canned beans and skip to adding everything to the crock or pre cook the beans, beans are nearly impossibly to over cook and that way you would know your beans are tender. Thanks for letting me know and I hope things work better next time. I actually didn't add any salt to the recipe. I try to cut it out of recipes up front for health reasons and add after the fact if it only really needs it. It's possible the beans were older, though I had just bought them, but I didn't check the expiration on them. I ended up heating the leftovers on the stove on low at a rolling boil, adding water for consistency, for about 15 minutes for a bowl sized portion and that worked pretty well. Next time I probably will do the quick soak where you boil them off first. I hate to used the canned ones because of all the added salt. Thanks for the feedback! The recipe really does have a delicious taste to it! im an idiot and left my crock on keep warm instead of low, if i put it in a pot how long should it take? Oh no Erika! If you bring it to a rolling boil and then reduce to low and cover I'm guessing it will take anywhere from 1 1/2-2 1/2 hours. It will really depend on how fast the beans soften. 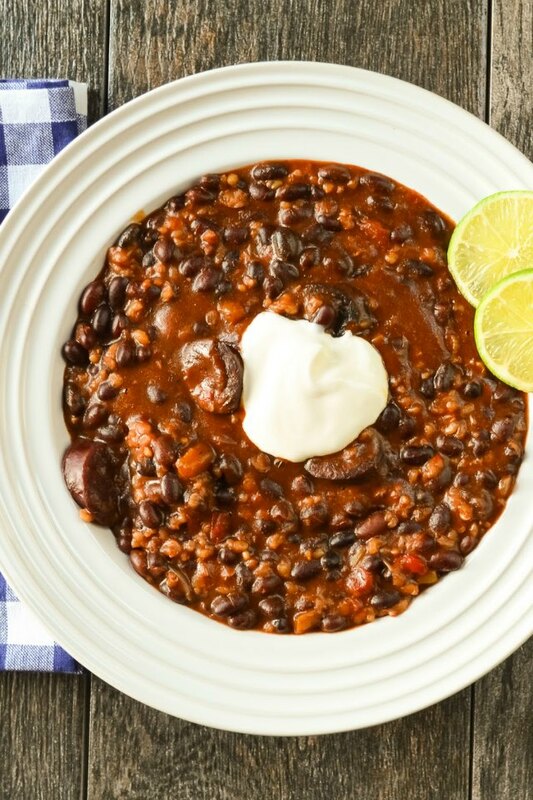 Black beans & rice is such a wonderful classic dish! Love your crock pot version.